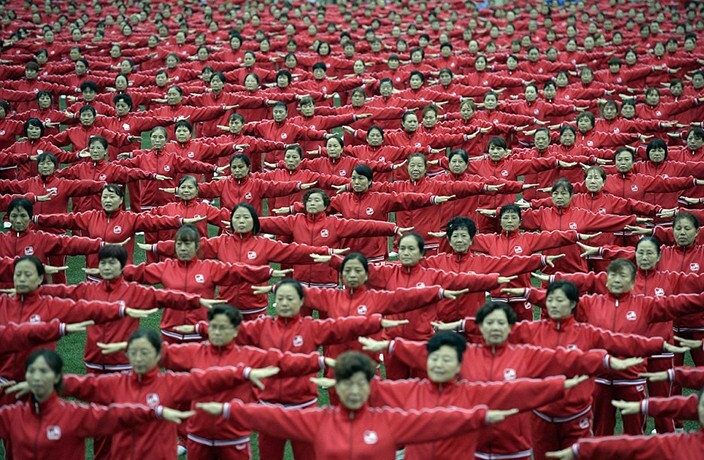 Earlier this week, aunties across China came together to create an epic synchronized square dancing routine featuring more than 50,000 participants. In total, 50,0085 people in 14 Chinese cities — including Chongqing, Shenyang and Nanjing — performed the same routine simultaneously at 10 am on Monday, setting a new Guinness World Record for the largest synchronized square dance. (That record is not to be confused with the world record for largest choreographed square dance, set earlier this year in China). They smashed the previous record of 18,431 dancers, also set in China on the same day last year. Most of the dancers involved were retired women, however, anyone interested was welcome to bust a move. To make it even better, each member of the square-dancing squad wore matching red tracksuits. The main purpose of the massive dance party was to draw the public’s attention to the health and welfare of retirees in China. In Chongqing 4,000 dancers gathered in a school playground. The same music was played at all 14 locations, including songs like "The Cup of Life" and a Spanish bullfighting tune. Red Dance, a company with a mission to promote square dance, was responsible for the organization of the event. The amount of participants in this style of exercise aged 60 or over in China has reached around 100 million, making it almost impossible not to see dancing grannies (or 'dama') in Chinese parks. China's square dancing phenomenon has been in the headlines a lot recently, as rumors of 'dancing granny crackdowns' have made headlines. As of 10.30pm last night, nine people were killed owing to the crash, with 46 injured. Among the wounded, three suffered serious injuries. The child's parents died in an auto accident days before a planned IVF procedure - but their frozen embryos lived on. Police have released an official statement about this morning's van crash in People's Square. At least 18 people have been hospitalized, three with serious injuries, after a van crashed in Shanghai's People's Square earlier this morning. Your monthly guide to the best of Macau. Keen to relive the glory of yesterday's yuletide joy? This video​ of grannies square dancing with frying pans will put you in a good mood.